Wow — these socks went really fast! Probably had something to do with the fact that they were mostly plain stitch — I wanted to watch the Trekking colors change and see the detail from the shaping. I’m still having some challenges with getting the fit right using her numbers. 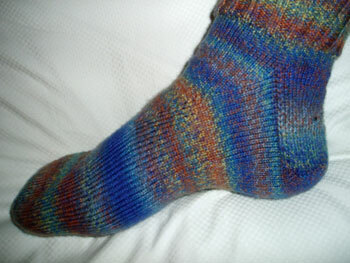 I seem to need to round down on measurements dealing with length, and to add a stitch or two to the heel area to get the sock over my foot comfortably. 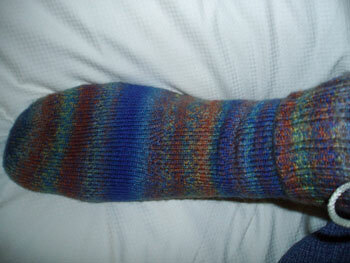 These are better than the red Coriolis socks, though, so I’m making progress. You are currently browsing the J.Sews blog archives for March, 2008.